Egg producer and packer LJ Fairburn & Son has been named Rural Business of the Year at the annual Amazon Growing Business Awards. The Lincolnshire firm was crowned the winner of its category at a showpiece ceremony in London on 28 November after competing against companies from across the UK for the top prize. 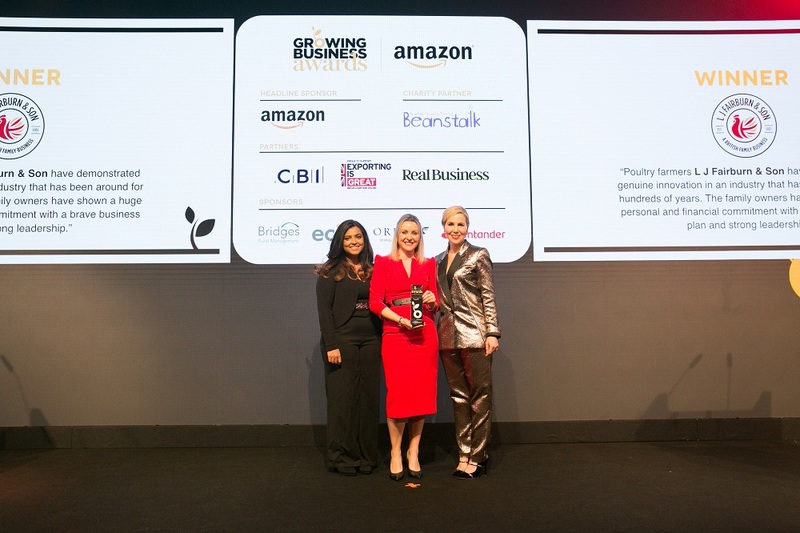 The Amazon Growing Business Awards, which celebrates 20 years this year, are the UK’s most established and respected recognition of SME and entrepreneurial success. Sarah Louise Fairburn from LJ Fairburn & Son said, “I’m thrilled to be bringing this award back home to Alford. Our team is so dedicated and together we have helped to grow our business into something we can all be really proud of. Being rurally-based is not only crucial to our business, but part of our family heritage, and with the development of technology we are now connected to businesses and customers all over the country.